Berlin Biesdorf, in the area Apollofalterallee/Kohlweißlingstr/Distelfalterstr. Helipad 1028 for Engineering Construction Bataillon 22 (PiBB-22) of former East German Ministry of National Defense (MfNV). Usable at day and night during good weather conditions. The Engineering Construction Bataillon 22 (Pionierbaubataillon 2) was directly subordinated to the East German Ministry of National Defense. 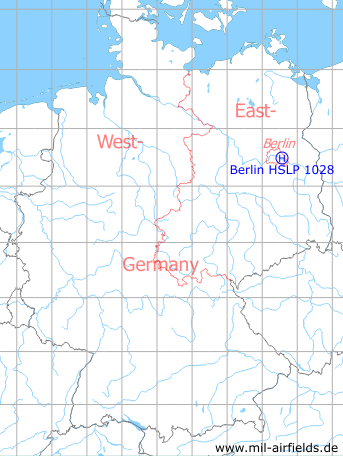 The deployment of East German military units and the establishment of the helipad was illegal, as it violated the Berlin status.